Had a fantastic stay here. Location-wise an easy walk into the town and right by the ski bus stop so didn’t need to rent lockers by piste. We stayed at Les Anemones during February half-term 2019 as a family of 9 adults and 7 children. The chalet itself is lovely; well appointed and sensibly laid out. We particularly liked the fact that there were eight bedrooms each accommodating two rather than the French habit of sticking bunk beds everywhere. Both bedrooms and living area are spacious and comfortable, although a few extra pillows would not go amiss! There is an equipment room with a really useful boot warmer/dryer which is on the ground floor so helped us keep the rest of the apartment tidy. In terms of location, although the chalet is a walk from the town centre (probably only 15-20 minutes though), it is only about 50m from the 'Access Valee Blanche' green run. This allows one to ski to the Petite Aguille chair which gives easy access (on a green run) to the main resort area. My only real criticism is the somewhat hidden extras. When renting a chalet I would ordinarily expect things like cleaning, linen and towels to be included. They are not! If you want linen and towels to be provided it adds over 300 Euros to the total bill. Equally, there is a cleaning 'deposit' of 350 Euros. 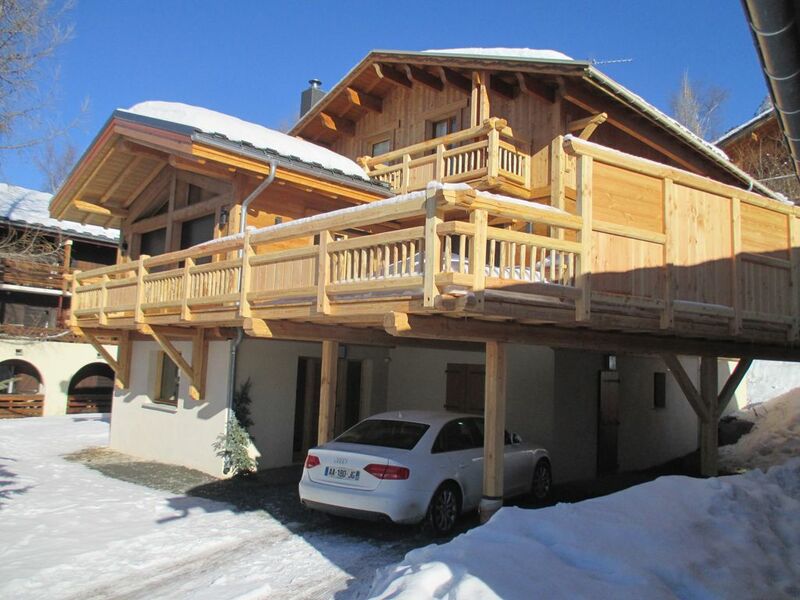 It is possible to avoid the charge if the chalet is left immaculate but in my view it really ought to be included in the price, and certainly seems on the high side. The pros definitely outweighed the cons but justify the deduction of half a star or so. Zeer ruime, lichte en comfortabele chalet op 50 meter van de skipiste. Aangenaam gelogeerd met 16 personen, mooie tweepersoonskamers met elk een eigen badkamer met WC, douche en lavabo. Zeer goed uitgeruste keuken, terras ligt heel de dag in de zon. Ruime inkomhal en verwarmde ski-opslagplaats. Voldoende parkeergelegenheid. Vrij groot skigebied, met zeer veel pistes die er half april nog heel goed bijliggen. Grand Chalet,1 sdb par chambre, proche des pistes, très bon WIFI, très bon service en cas de soucis. Les point négatifs : Son prix de location, chalet vieillot, sdb sommaire, réserve d'eau chaude très limite (13 pers), petit frigo, compter 1h pour arriver à 3200m. Nous avons tout fait pour que vous passiez un agréable séjour dans le chalet. Bref, le chalet sera entièrement rénové et agrandi en automne 2017. Un acompte de 25% sera demandé à la réservation. Le solde 30 jours avant l'arrivée. En cas d'annulation, merci de me prévenir rapidement afin que je puisse relouer le chalet. Si je reloue la semaine, vous serez remboursé à 100%.